ENGLEWOOD, Colo., September 11, 2018 (Newswire) -The 2017 Hurricane Season will be a memorable year for the United States. Hurricane Harvey, Hurricane Irma and Hurricane Maria all impacted the United States from Aug. 25 through Oct. 2. These three named storms are listed in NOAA’s Top 5 costliest storms - the costs are estimated at $265 billion. The mass devastation caused by the storms created a major workload and resource challenge for the insurance industry and homeowners. MADSKY quickly deployed, on a mass scale, its technology, suppliers and contractor resources to help two of its insurance partners whose homeowners were impacted by the storms. Within two months, the organization had processed and completed 10,000 claims that had roofs that needed to be repaired or replaced. What would normally take 2-3 times as long to process, MADSKY was able to process in two months. 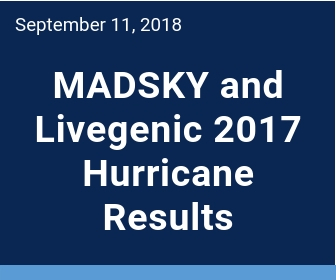 The MADSKY and Livegenic partnership began in 2016 when LC approached Livegenic about creating a virtual inspection tool to deploy for roof claims. The combination of the two organizations' capabilities has proven to streamline and accelerate the claims process. Olek Shestakov, CEO and founding member of Livegenic, stated, "When we founded Livegenic, our vision was to take video on the fly when a customer needs help; during the aftermath of a storm is when a homeowner needs urgent help. Partnering with MADSKY is a perfect example of integrating our award-winning, real-time video collaboration platform to scale resources and accelerate the completion of the claims process." About MADSKY MRP LLC: MADSKY is the first roofing-focused managed repair program (MRP) in the country, providing access to unmatched pools of vetted and trained professionals across the roofing repair process. MADSKY’s “network of networks” is the largest collection of roofing contractors in the U.S., consisting of more than 3,000 certified roofing contractors and a supplier network of more than 3,600 across all 50 states. MADSKY’s proprietary Friction-less Customer Experience (FCX) software connects the carrier, contractor and consumer, allowing for seamless communication and optimal utilization of all resources. Headquartered in Englewood, Colorado, MADSKY is quickly redefining and enhancing the insurance claims experience for roof repairs and/or replacement. About Livegenic: Livegenic delivers an award-winning real-time video platform for insurance. We connect every part of the claims ecosystem to help insurance organizations reduce costs, improve customer satisfaction and mitigate business-related risk.